If you guys have been following us for the past few years you should know we are huge fans of Teresa Chiba’s INU-HARIGON even made it on to one of my personal Top Picks of 2016. 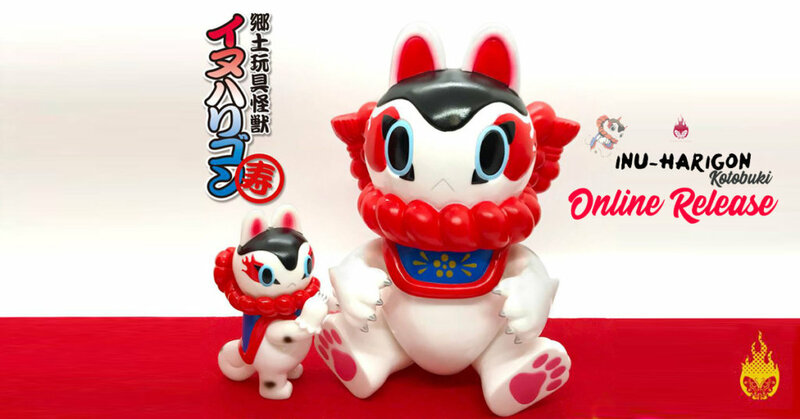 At last years Designer Con 2018 at Medcom Toys booth our heats went into overdrive as we saw the XL Kotobuki size INU-HARIGON and its made appearances at various Asia conventions but sadly we couldn’t find an international order UNTIL NOW as Teresa Chiba has opened online orders for INU-HARIGON Kotobuki size! Regular size (Original Color White) Inu-Harigon (White Color) 4,500 Yen (tax included) full length about 10 cm. Take our word for it the INU-HARIGON are beautifully designed and made, we have one in our collection already and waiting to add another to the collection. Folklaw, cuteness and flawless paint application rolled into one it’s a no-brainer want. Find Teresa on Instagram, Twitter and Facebook fan page. Check out my Top Picks of 2016 which includedTeresa’s INU-HARIGON HERE.